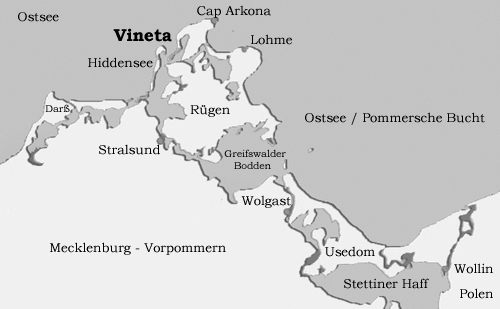 Vineta was a legendary city on the Baltic in what is now the German state of Mecklenburg-Western Pomerania. The city was destroyed when it sank into the sea and thought by some to be the source of the Atlantis story. It is reputed to have existed near the north German city of Barth. Doris Manner has written a book on the subject and also has a website(b), which is available in German and English. She courageously identifies Atlantis with Vineta, Titans with Teutons and Vineta, in the past referred to as Niniveta, with the Nineveh of the Bible. A more conventional history of the lost Baltic city is offered by Ingrid & P.Werner Lange in their Vineta, Atlantis des Nordens (Vineta: Atlantis of the North)..